Dixie Diners’ Club Boston Cream Pie is one of our family favorites! Just add eggs, sour cream, and butter. 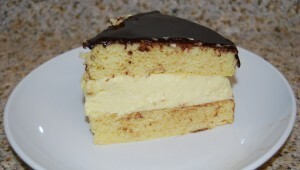 It’s so delicious that your guests will never even guess it is actually a carb-controlled Boston Cream Pie! Makes 9 servings with just 5 net carbs per slice – and they are nice size servings! Dixie USA and Carb Light Living™ partnered to offer this exclusive promotion, which is only available to Carb Light Living™ Facebook, Carb Light Living™ Website and Carb Light Living™ Twitter subscribers!Place your order at DIXIEDINER.COM and enter coupon code #30OFF at checkout. Limit one coupon per organization or individual. This offer expires June 1, 2012.Click on the SUBSCRIBE BY EMAIL button located in the top-right corner of the Carb Light Living website (below the search box) to receive all future promotions!